I have figured out how to import my PDFs into Docear, but when I try to in a sense "import" them into the References tab (right hand box, area)or transfer the document information (authors, journal, year, etc.) the data is never transferred correctly and when I end up inputting this info in manually, the references that end up in my Word document are almost always incorrect (i.e., missing authors, abbreviated author names, etc.) and I have no idea what I am doing wrong. I know there is an option when you click on a reference in my main work area and I hit "Create or Update Reference" I have options, one of them is to fetch the data from the Docear Digital Library - this never works, is something wrong with my PDF? 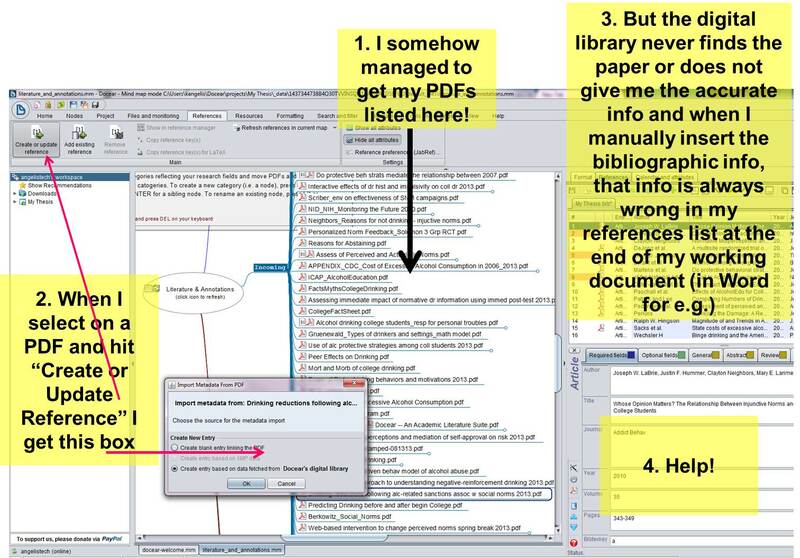 but when I try to in a sense "import" them into the References tab (right hand box, area)or transfer the document information (authors, journal, year, etc.) the data is never transferred correctly. Could you please explain the steps you are using in Detail? We know that the current implementation of our PDF metadata extraction is not very stable and we have some ideas on how to greatly improve the situation. We are currently in contact with a student at our University who might want to help us to implement the necessary changes. However I am not sure if he will accept the offer, if he can implement it and how long it would take. Could you please explain what exactly you are doing? Version: 1.0.33.2 ; Page loaded in: 0.056 seconds.